Recap of Cena returning to RAW and being attacked by the reformed Club. New Day heads to the ring. They are a little upset about a couple of things. First, that they didn’t get to see Stephanie dance on RAW, and second, that The Club attacked them. Anderson and Gallows then come out to the stage. They say that the tag titles will soon join The Club. New Day wonders what the rules of their club are. Are there dues? Gallows and Anderson say there are, and they’re taking them out on New Day. New Day points out it’s currently three on two. 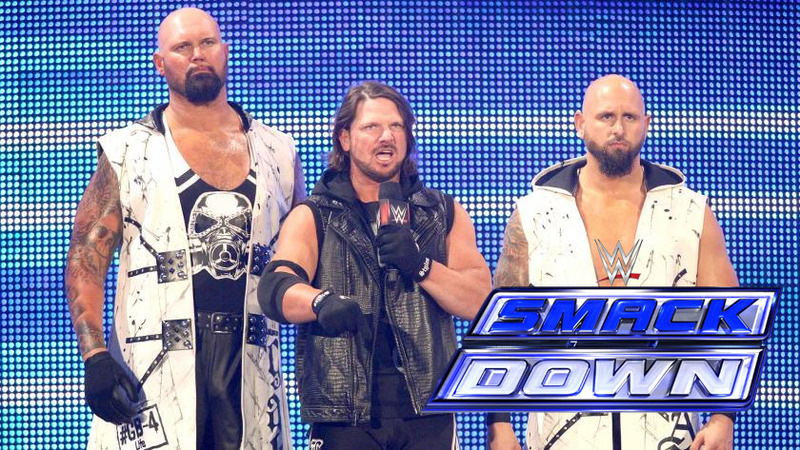 AJ Styles then joins his fellow club members. He calls Kofi a joke. Kofi responds by listing his titles and telling AJ it took him ten years to even get to the WWE. AJ issues a challenge for tonight and New Day accepts. Pretty good match. There was a nice segment where Becky was going for an armbar and Charlotte powered her up and dropped her with a sitout powerbomb. The finish was so-so, a silly call by the ref that usually isn’t made, but it was okay for a TV match I guess. After the match, Natalya meets Charlotte and Dana on the ramp and herds them back towards the ring. After a minor scuffle Charlotte and Dana make their exit. Renee Young welcomes Dean Ambrose and Sami Zayn. She wonders how they’ll work as a team tonight. Sami says they have a pretty good record together, regardless of Dean’s comments about Canadians. Owens comes up and says he dislikes how Sami is trying to manipulate Ambrose. Sami calls Alberto Del Rio a snake. Also, Kevin Owens doesn’t like Renee’s necklace. Good match. You could kind of see the end coming once the sequence started, but this match did show a good amount of progress in the team of Goldust and R-Truth without taking too much away from the Dudley Boyz. After the match, Breezango make fun of Golden Truth from ringside. A recap of the Corbin/Ziggler feud so far. Baron Corbin asked for an interview outside the arena with Renee Young. He says the crowd doesn’t deserve him. The next time he’ll enter an arena is to destroy Dolph Ziggler. He then walks out into the street. Really good match! Everything worked really well in this match. Big personalities, big shifts in momentum, big moves, good stuff. Owens versus Zayn is the front-runner for feud of the year so far, but their interactions didn’t overshadow the rest of the match. All around great match with an exciting finish. Kevin Owens is irate after the match and pulls out a ladder. Cesaro decides to join the party and comes out to uppercut Owens. Cesaro grabs the briefcase that was hanging above the ring. Owens is pissed. Good match. Rusev attacked Swagger before the match, so Swagger never really had a chance, but he put up a good fight and still made it interesting. After the match, Rusev won’t release the Accolade, so Titus O’Neil runs out to chase Rusev away. Bob Backlund wants a training update and doesn’t want Darren Young to ever run. He also has Young’s car keys and expects him to walk to the next show. From RAW, Rollins teases an attack on Reigns. Very good match, as expected. Styles and Kingston match very well together. It started fast-paced and didn’t really let up throughout. The end started to break down as the guys around the ring started going after each other, and that led to the finish. I think this is a good start to something even greater. There were lots of good matches and some nice segments on this show. One of the better Smackdowns in recent memory. The main event was good too, but this tag match had a more exciting finish.